Defence Minister Shri Manohar Parrikar releases the sixth edition of Brahmand World Defence Update 2017. Also present on the occasion, Minister of State for Defence Shri Subhash Bhamre who has penned the foreword for the yearbook, Chief Minister of Goa, Shri Laxmikant Parsekar and Dr. Sudhir K Mishra, CEO & MD of BrahMos Aerospace. 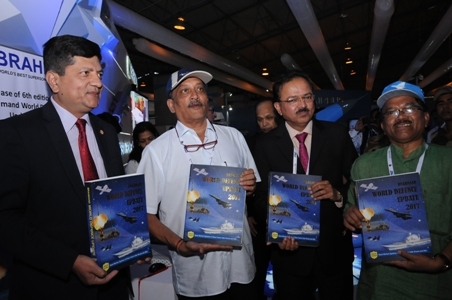 BENGALURU: Honourable Defence Minister of India Shri Manohar Parrikar on 14th of February, 2017 released the sixth edition of global military yearbook “Brahmand World Defence Update 2017” at the BrahMos Aerospace pavilion on the inaugural day of Aero India 2017 being held in Bengaluru. Also present on the occasion were Minister of State for Defence Shri Subhash Bhamre who has penned the foreword for the yearbook, Chief Minister of Goa, Shri Laxmikant Parsekar and Dr. Sudhir K Mishra, CEO & MD of BrahMos Aerospace. An initiative of BrahMos Aerospace, Brahmand World Defence Update 2017 provides incisive, comprehensive and up-to-date facts, figures and data on the armed forces of 113 countries worldwide with the objective to give a comprehensive assessment of the present-day global military order. BrahMos Aerospace is a Joint Venture between DRDO of India and NPOM of Russia. The yearbook has covered each country’s overall military capability by listing its existing weapons' inventory, ongoing/ future arms procurement plans and annual defence spending besides detailing important political &defence personnel along with the country’s conflict areas. It has also provided detailed strategic information on 33 leading countries selected from each continent/region with key focus on their geopolitical importance, strategic relations, threat perception, defence capabilities and defence budget trends. In its latest issue, the yearbook also includes a new chapter on “Naval Warfare Systems “of five major powers – China, France, India, Russia and the USA. With swift advancements in military technology worldwide, naval warfare domain too has undergone major transformations to include a wide range of top-of-the-line maritime assets for littoral, surface and sub-surface warfare missions. Development of aircraft carriers, attack submarines, missile destroyers, frigates, amphibious vessels, patrol craft, replenishment ships along with state-of-the-art weapons and systems have greatly widened the realm of naval warfare strategies and tactics in modern times when sea dominance has become a critical aspect for many countries aspiring to attain global power status in the 21st century world. The new chapter on Naval Warfare Systems puts the light on each of the listed country’s naval & naval aviation platforms along with major weapon systems which are detailed comprehensively. 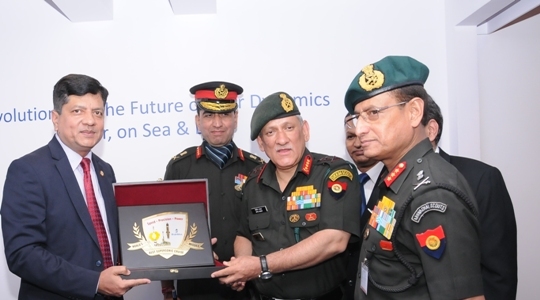 Like all its previous editions, the military yearbook promises to be a vital source of reference for the armed forces and defence establishments and also for the global arms manufacturers, research institutions, academia, think-tanks, Captains of industries and even for the general readers keen to know about latest global military trends and developments. The book is published by Pentagon Press.